The general trend in wester civilization and society for the past 200 years is to constantly become more productive. In other words, get more things done in the same amount of time (or same amount of work in less time). This idealization or worship has lead to a vicious circle of increasing stress and loading that often appear unmanageable. Nothing new. We all know this. In this blogg post I will introduce the best practices that i have come accross in the aspect of time management. The main reason why I consider this as a such an important topic is not to enable you to do more things, but to have more time for what really is important: to spend time with our loved ones. Many procrastinations have the tendency of exploring the “weird” and fascinating world of YouTube. I was no exception. During one of mine adventures in the YouTube-world, of course a day before an important project dead-line (student syndrome), I found a video lecture held by Randy Pausch under the title: Time Management. Little did I know that this seemingly harmless “procrastination-webb-click” would result in a suicide for my inner procrastinating-self. Randy is by far one of the most inspiring human-beings I know. At first glance Randy appears as geeky engineer with great sense of humor. However, what makes Randy so extraordinary is because he is a man of his word. Literally. Randy has only months left to live as a result of a severe cancer. Despite this devastating reality, he is holding lectures and doing his work. Why? Why on earth is he not spending his last amount of time with his family instead? Well, according to him this is possible because he manages his time so well. Always plan – The most important thing about time management is planning. Without one you will fail every single time. Randy said it so well with “not having a plan is planning to fail”. Covey’s Quadrant – This framework is all about priotising the things you need to do (see figure below). This framework super useful and has helped me alot! The idea is that the matrix have rows of: “important” and “not important”. While the columns have: “due soon” and “not due soon”. By putting all the things you will do in this framework, you will see what is the thing you need to work on right now and what is redundant. Empty email inbox – When was the last time you had an empty inbox? If your answer is ” I don’t remeber” Oh boy you have a long way to go. In the end of the day always have an empty inbox, learn how to put your email into folders. NOTE your email should never be your todo – list! One drawer policy – Buy a box where you put all your important papers ALWAYS. This will save you a lot of headaches and time. Multiple desktop screens – Once you have them you will never give up them. Keep a time diary – Keep a diary on how you spend your every quater of your day. By doing this you get hard data on how you really spend your time. Pacts are golden – When somebody asks for your time, always make a pact. For example, if your friend asks your help in moving stuff, say that you will come if he can get 3 more guys to help. Another classic is that you give them only 3 hours, no less or no more. Eat the ugliest frog first – Do the most burdensome task first thing in the morning. So simple, but it will make you so much more productive. Limits and Deadlines – The people that have limited time always get so much more done. A great example of this is students who have families, their time is limited and they adapt according to it. Therefore, always use deadlines! They are a means to an end to make you achieve more with less. Here is the transcript of Randy’s presentation. 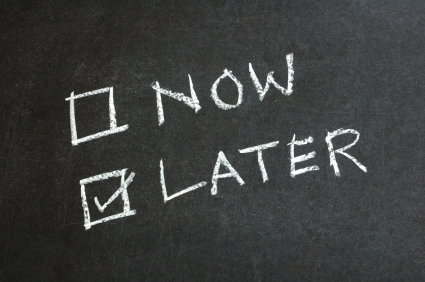 procrastination is a habit and habits are powerful. Professor Barbra Oakley (creator of the most viewed MOOC on Coursera – Learning about Learning) acknowledges this fact and has observed the process of making and establishing habits. According to her the use of pomodoro technique is an effective way to develop a productive or “good” habit. The name pomodoro origins from italian word for “tomato”, though the actual technique has very little to do with the fruit (recently I learned that tomato is not a vegetable!). Instead it uses a timer. The fundamental idea is that you set the timer for e.g. 15 – 25 min and start to work on your given project. When the time is up, you take a 5 min break before repeating this cycle. After 4 cycles take a longer break of 30 min and then start the procedure all over again. It is simple, but super effective! There are many pomodoro applications available, I myself uses one on my mobile. It is worth mentioning that this method focuses more on learning new things. Thus I will make a more extensive post later on this specific subject. There is a clear misconception regarding time management that the concept is resulting in more time. This is both wrong and naive. As Laura Vanderkam put it in her TED talk: “everybody got 24 hours (or 168 hours a week), no more or less“. This means that cultural and pop icons such as Beethoven and Roger Federer are in the same position as you – we have the same 24 hours a day. So what does time management provide us with then? Simply put, it allows to make more of what we already have, but does not increase our original resource – the time. However, istead she points out that time is highly elastic. What this means is that if we truly must and need to do thing, we somehow find the time to do so. For example, stressful people who seem to have no extra time availabe, will arrange it, if it’s truly urgent. A very intresting view of things. Laura Vanderkam gives us also some good news: we have more than enough time. It is a mere illusion that we don’t have it. So when somebody next time tells you that she don’t have time, then in other words you are not that person’s priority. It is the harsh and raw truth. No need to cry over that. Intrestingly, people alos make time literally elastic. A study conducted shows that people often exaggerate their amount working hours by about 5 to 10 percent. But what really is surprising is that people who states that they work over 70 hours had it wrong by 25 hours. Same with those who stated they work 65–74 hours were off by close to 20 hours. Likewise, those who stated 55–64 hours were still about 10 hours north of the truth. You get the trend. Therefore when working with time management, there are many illusion and biases that distort our understanding of the reality. Hence, to truly improve our use of time, we must become 110% objective and true to ourselves. Break the illusion! Mårten Mickos is the author of the great blog – School of Herring. In one of his posts he defines the distinction between efficient and effective. At first glance both concepts appear the same, so what is the difference then? Stunningly it is like day and night. Efficient can be compared with the physics metric of effect, which is defined as the amount of work done over time. Essentially this means that the more efficient one are the more work you do. Effective on the other hand focuses more on doing the right things. Regardless the point is clear. There is a huge difference between efficient and effective. I believe that doing things effectively is the ultimate core of time management, not doing things efficiently. The reason for me to say this is that the outcome of a good time management may result in higher efficiency (being efficient), but it is certainly not generating/leveraging the same value opportunities as being effective. Seth Godin makes a similar interesting distinction between the concepts of “long work” (efficient) and “hard work” (effective) which I find very compelling and close to the truth of what great time management actually is. Being effective means sometimes to be slow (or appear lazy as Bill Gates put it) and taking small baby steps before you can make a run. This means that temporaily you may be frusrated at the pace of progress, but in the long run it will pay-off. Big time. Bill Gatesunderstood the importance of being effective and it payed him off. Also doing things “slower” than other gives you new insights that other efficient people may oversee or miss. For instance, it can be something concrete like a simple and beautiful solution, or it can take form in new valuable intangible assets. “What new intangible assets?” you may ask. Let me tell a true story that I came across the other day. It is about a NBA basketball player called Isaiah Thomas. He is currently one of the greatest in the game, however the road to greatness has not come easily. Hard facts speak for themselves, Isaiah Tomas is 5ft 9 in (1.75 m) in professional league where the average player is listed at 6 ft 7 in (2.01 m). This obvious and clear disadvantage made Thomas always underrated as a player. But made him more dedicated and more effective when developing his game. As a result, he “slowly” developed new intangible talents, such his outstanding cool mentality, which makes him into the winner he is today. Thus, although he may physically have the smallest heart in the league, he clearly proves that his heart is greater than anyone else’s on the basketball court. Slow is the new Fast. Period. Rome wasn’t buil in a day. This is especially true for huge project, such as Sagrada Família. Despite this I am convinced that almost all building project take to much time and consume to much financial resources. Is this true for all bulding projects? This is being effective in a nutshell. Not that one can utilize ones man-power to the fullest extent, but to put all the different multi-dimensional resources to its best use. This involves having the perfect preparation and strategical plan (remeber, slow is the new fast) and to prefectly execute it. Therefore the conclusion is that being effective is a multi-dimensional process, while efficient is a one-dimensonal view. My advice is to widen that view of yours! Become more effective rather than efficient! Remeber that efficient people are often too obsessed with the one-dimensional perspective and therefore have a tendency to drown in work and become burnout. Being effective is the key to a successful time management take is slower in order to become faster. While being efficient isn’t a bad thing, I share a word of caution: Rome wasn’t built in a day, but it sure burnt down in one. Finally, the key take from this post is that time is a precious commodity, which we need to defend with all our might and power. After all “we might have less of it than we think”.